Here’s another article about prices from last Tuesday that should be read in conjunction with today’s article on prices. If we keep doing the same things over and over again to make things better, and they don’t work, that is a sure sign we are crazy, so ideas like antitrust enforcement, while a good idea in general business, and the incentivizing of more cost-efficient physician referrals, only scratches the surface. The report suggests measures aimed at cutting healthcare costs focus on issues like antitrust enforcement and incentivizing more cost-efficient physician referrals. This entry was posted in Health Care, Health Care Costs, hospital administration, Hospital Fees, Hospital Systems, payer, policy & regulation and tagged Health Care, Health Care Costs, hospital administration, Hospital Charges, Hospital Costs, hospital systems. 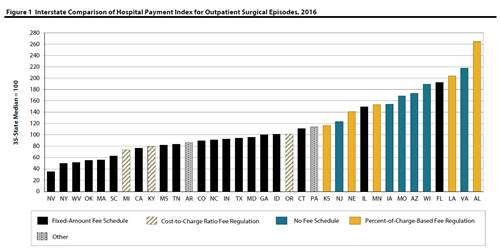 payers, Hospitals, Mergers, policy & regulation, Prices on February 12, 2019 by Transforming Workers' Comp. Shoutout to Promed Costa Rica for the following article posted today on Facebook. CMS has been for decades the crux of the problem with the American health care system, Every model, program and scheme they have implemented addresses only the symptoms, but not the cause of the disease the patient is suffering from. As I wrote yesterday, and the week before in my review of Health Care under the Knife, the real cause of the complexity, confusion, dysfunction and overall failures of the health care system is the system itself — meaning the economic system that has proletarianized physicians, commodified, corporatized, financialized, and monopolized health care in this country. So now, this talk of price transparency, when the cost of care is already too high compared to other Western nations, is just a placebo being administered to a dying patient — the American health care system. This entry was posted in ACA, Affordable Care Act, Capitalism, CMS, commodification, complexity, financialization, Health Care, Health Care Costs, Hospital Fees, Hospital Systems, Hospitals, MEDICAL COSTS, pricing and tagged ACA, Affordable Care Act, CMS, Costs, Health Care, Health Care Costs, Hospital Charges, Hospital Costs, Hospitals, Medical Costs on April 26, 2018 by Transforming Workers' Comp. In fact, they were cash poor, dirt farmers, tradesmen, owning very little except what they could carry on a horse, mule, or in a wagon as they migrated west in search of better opportunities. Until the New Deal, the Middle Class as we know it did not exist in such great numbers. True, there was a middle class in the cities and towns of the East Coast and Midwest, but most of them were descendants of immigrants from the 17th and 18th centuries, and rose steadily into the middle class as the nation’s economy shifted from a mercantile to an industrial economy in the first half of the 19th century. Consider the following quotes from three US presidents regarding the power of money and corporations. You will notice that none of them are wild-eyed radicals in the least. So it is no surprise that the Republican Party is ramming down the throats of the American middle class, a tax reform bill that will effectively wipe out the remaining members of the middle class, and redistribute the wealth to those making over $75,000 and those at the very top, the oft-mentioned 1%. My fellow blogger, and unsuccessful Democratic candidate for County Legislator in upstate New York, Joe Paduda, wrote a very potent analysis of the GOP tax scam legislation. Yes, I did call it a scam, but that is not my word. Others have used it in the past few days in an effort to derail and stop it from passing. Besides destroying the middle class, it will as Joe points out, bankrupt the health care system. Then we will have to go all the way to a single-payer system just to get the whole thing working again. It means we of the middle class had a very good run, but the ruling class has spoken, and they want us to disappear, or at least shrink to the point that we become unimportant to their pursuit of greater wealth. Why else would the donor class of the Republican Party, the Koch Brothers, the Mercer family, Sheldon Adelson, and the rest of their donors threaten members of Congress with no more funds for their re-election if they fail to pass this bill? There is a word for that, it’s called Extortion. And we are the sacrificial lambs. This entry was posted in ACA, Affordable Care Act, American History, Capitalism, Congress, Cost Shifiting, Democrats, Federal Government, Health Care, Health Care Costs, Health Care Reform, Health Insurance, Health Plans, Health Policy, Hospital Closings, Hospital Fees, Hospital Systems, Hospitals, Middle Class, Republicans, Uninsured and tagged ACA, Affordable Care Act, Congress, Cost-shifting, Democrats, Health Care, Health Care Costs, Hospital Charges, Hospital Costs, Hospitals, Middle Class, Republicans, Taxes, Uninsured on December 1, 2017 by Transforming Workers' Comp. Models, Models, Have We Got Models! FierceHealthcare.com today reported that CMS (those lovely folks with all them rules), launched three new policies Tuesday that continue the push toward value-based care, rewarding hospitals that work with physicians and other providers to avoid complications, prevent readmissions and speed recovery. The newly finalized policies are meant to improve cardiac and orthopedic care, and also create an accountable care organization (ACO) track for small practices, according to the report. There will be three new cardiac care payment models for hospitals and clinicians who treat patients for heart attacks, heart surgery to bypass blocked coronary arteries, or cardiac rehabilitation following a heart attack or heart surgery. Federal officials said that the cost of their care…varied by 50% across hospitals and the share of patients readmitted to the hospital within 30 days also varied by 50%. Medicare, the article points out, spent more than $6 billion in 2014 for care provided to 200,000 Medicare patients who were hospitalized for heart attack treatment or underwent bypass surgery. As for orthopedic care, the new payment model is for physicians and hospitals that provide care to patients who receive surgery after a hip fracture, other than hip replacement. They also finalized updates to the Comprehensive Care for Joint Replacement Model, which began earlier this year. So far, that’s three models. But wait, there are more where those came from. There’s the new Medicare ACO Track 1+ Model, that has a more limited downside risk than other tracks in the Medicare Shared Savings Program (another model I discussed a while back in the post, “Shared Savings ACO Program reaps the most for Primary-care Physicians“). Why am I pointing out the problem with the release of new payment models? I’ll tell you why. When I began my MHA (Masters in Health Administration) degree program, I took an online elective on Healthcare Quality. The textbook we read discussed how CMS over a period of several decades, created and instituted so many models and programs, that it made me wonder why our health care system was so complex, expensive and so out of whack compared to health care systems of other industrialized countries. Winston Churchill said that you can always count on Americans to do the right thing, after all the other things were tried. We are still on the trying part, and I am afraid we will never get to where Sir Winston said we would. This entry was posted in ACO, Bureaucracy, Cardiac care, CMS, complexity, Federal Government, Health Care, Health Policy, Hip replacement, Hospital Fees, Hospitals, Medicare, orthopedic care, physicians, Quality, Reimbursement, Reimbursements, value-based care and tagged ACO, alternative payment models, CMS, Costs, Health Care, Health Care Costs, Medicare, programs on December 21, 2016 by Transforming Workers' Comp.